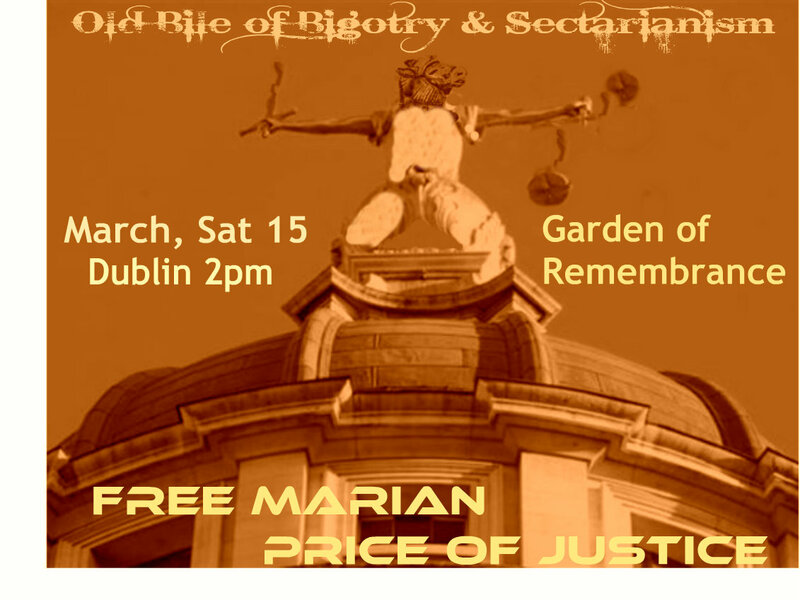 Irish Blog: Farcical Charges Against Marian Price Again ! 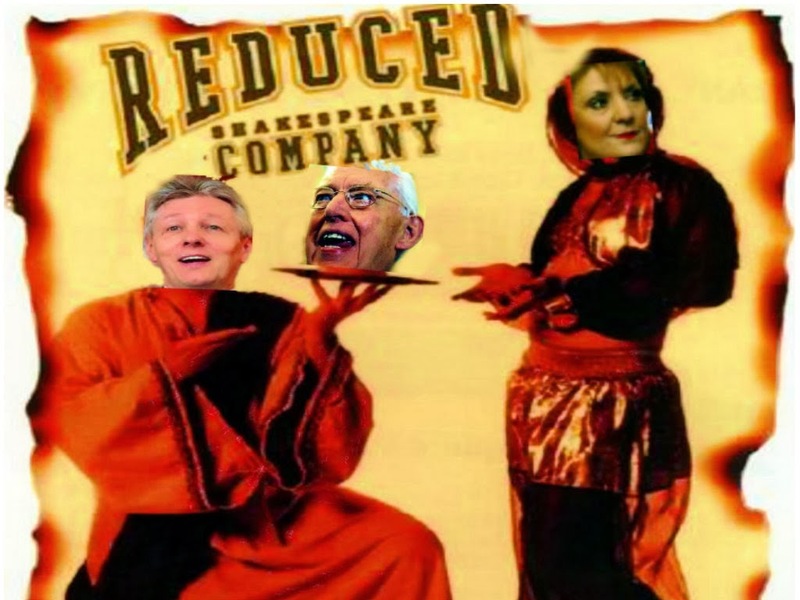 Farcical Charges Against Marian Price Again ! Farcical charges ahead of an anti-internment March in Dublin, have been re-instated by the British against Marian Price again, creating further internment again by remand. Charges previously thrown out of court by a judge and dismissed against four people, including former hunger striker Marian Price have been re-instated by the Public Prosecution Service of British Occupied Ireland. Marian Price's lawyer said she was seriously ill and may not be fit to appear in court.The charges relate to a traditional Easter republican ceremony in Derry in April 2011. In May, a judge dismissed the charges and said he would not return the four for trial as there were "no papers in front of him" and the charges were not proceeded with. However farcically the decision by the PPS means that the four will now face the original charges again and be on remand for yet many more years as a result. Three Derry men were freed but Ms Price continued to be held interned without trial. Ms Price, under her married name of Marian McGlinchey was charged after holding up a piece of paper on a windy day at the ceremony, along with Paddy McDaid, 42, of Sackville Court, Frank Quigley, 29, of Elmwood Road and Marvin Canning, 50, of Glendara, all of Derry with taking part in a meeting in support of a proscribed organisation.They are due to appear in a preliminary enquiry at the city's Magistrate's Court on 27 September. sectarian loyalist rioting in north Belfast.Ms Villiers is a brother of the 4th 'Earl of Clarendon' George Villiers and has represented the constituency of Chipping Barnet, situated between Hertfordshire and Finchley in north London, since 2005.
the criminalisation of Irish political prisoners.His high-handed British rule coupled with internment made him a highly unpopular figure across the political divide in Ireland. The appointment of Villiers, the first woman in the post since the relatively more reasonable Mo Mowlam, may bring a more human outlook to British rule in Occupied Ireland and boost hopes for peace however with recent events, it is becoming clearer that justice is not possible in the sectarian statelet for ordinary Irish working people or people of no property. Villiers has a royal 'true blue' Tory background and is unlikely to help resolve sectarian problems created by her predecessors, resulting in riots and intimidation. ahead of a giant sectarian parade planned later this month. The article below explains the saga of the long running debacle of the internment without trial of Marian Price and the type of British injustice feeding the violence, that poisons young Irish minds and hearts with injustice. "The accumulation of all powers, legislative, executive, and judiciary, in the same hands ... is the definition of tyranny." Forty years ago Marian Price marched for civil rights, with her friend Moira Drumm in British Occupied Ireland after being inspired by the Black Civil Rights movement lead by Martin Luther King in the US. Over 40 year later on a windy day, she reached up and held a script, to prevent it being blown away, while a masked man read the traditional IRA’s “Easter Message.” She was arrested on May 13th 2011 and charged with encouraging support of an illegal organisation. Marian appeared three days later in court in Derry, where she was granted bail but as she left the courthouse, she was re-arrested, as per order of a document, signed by the Vice royal Owen Paterson and taken to high-security, solitary confinement in the all male Maghaberry jail. The court case was meaningless, because Paterson’s contempt for justice and due process was trumped by his order to override the bail decision of the Judiciary. Now, as a result of sensory deprivation torture, she is seriously ill and has been transferred to a Belfast hospital, like her former friend Moira Drumm whom the British shot dead in a Belfast hospital many years ago. Marian is under armed guard with locked bolted doors, barred windows and under 24 hour surveillance. She is gravely ill with pneumonia, while probably being held until she dies in one way or another. Paterson’s order for Marian to effectively die in a British prison, was based on “intelligence” information from his secret services, who have a vested interest in the internment of traditional Irish republicans and political dissidents. In July, Marian was then charged with “providing property for the purposes of terrorism” allegedly having bought a mobile phone which the British maintained was subsequently used in the killing of two British soldiers at Massereene barracks, back in early 2009. Marian was held then, for two days, questioned about this specific allegation, before being released without charge. No evidence was found in the interim or proffered to the court on this matter. The Judge looking at precisely the same lack of evidence, again granted Marian bail. But yet again as she left the court, another unelected vice royal Paterson order, took precedence over the judge and the court.The Massereene charge was meant to discredit her and associate her with the shootings to undermine a public campaign for her release which attracted considerable support, from people not politically aligned, who could not fathom what crime she had actually been committed, at the traditional Easter Commemoration. Since then the British have orchestrated several personal whispering campaigns, against Marian and her supporters. A year after her original arrest, the charges relating to the commemoration were thrown out of a Derry court by the judge, who was told, preliminary papers were still not ready. Judge McElholm declared every citizen was entitled to a fair trial, in a reasonable period and that the British had clearly not met this criteria. But again Marian was imprisoned by an order from Paterson. This was the third time a court ordered her released and the third time the unelected English Vice royal in British Occupied Ireland, overruled the court and said no. Further to overruling the judiciary, he also overruled his own Queen. Marian Price was previously given a full royal pardon by the Queen of England or the royal Prerogative of Mercy.Cardinal O'Fiach the head of the Catholic Church bore witness to the fact. Vice royal Paterson again claimed that this document, which would set Marian free, had been lost or shredded by his colleagues. This is a rather serious matter, because perverting the course of justice, is a very serious matter carrying a life in prison for ordinary mortals. Again the unelected English Vice royal Paterson in Ireland contemptuously dismissed the elected Irish Assembly member Ramsey's inquiry, stating that "unfortunately the Royal Prerogative of Mercy was not recovered but had no bearing on current circumstances. Patterson has now even gone further and is now demanding, the local elected Assembly be downsized and it's 'peace process' structures be dismantled. Vice royal Paterson the horsey blood sport enthusiast, married into British royalty, sniffed his stiff Tory upper lip and overruled their recommendation once again. Internment without trail, like all things experimented with in British Occupied Ireland, in the last 40 years of British war on the Irish people, is now being introduced in England itself. While Patterson was overruling his British judiciary and Queen, his Tory party colleagues are introducing a Bill to give it's Ministers power, to use secret service gestapo evidence in secrecy, under “Closed Material Procedures.” Such evidence would not be produced in court, for “national security” reasons, preventing even the accused, the right of defence or the right to know what charge exactly is being made against them.. When Marian was 19, she was one of nine members of the Provisional IRA, who planted four bombs in London, which included the Old Bailey almost 40 years ago in March 1973. Despite a two hour warning, a man died from a heart attack. The IRA team, included Gerry Kelly now a Minister at the Stormont parliament and she was also under orders of several current leading Irish politicians, involved in the peace process, a peace process undermining justification for huge secret service, British taxpayers budgets in Ireland. Marian Price was freed more than 30 years ago in 1980, suffering from tuberculosis, anorexia and weighing just five stone. She and her sister Dolours spent 200 days on hunger strike, demanding political status. They were force-fed three times a day for 167 of the 200 days, with a tube forced down their the throats into their stomach, which almost murdered Marian several times. The resulting trauma and psychological damage of ongoing torture then and now, led to a 1980 royal pardon because of imminent death. Marian has insisted from the moment arrested in May last year, that she was released in 1980 on a Royal Prerogative of Mercy, which Paterson does not have the authority to override. Paterson claims its terms, which he has not seen, authorizes him to override his queen. Marian's lawyers have repeatedly asked that the pardon be produced, so the terms can be checked by a judge. One does not have to be particularly bright, cynical or subjective, listening to the contradictions in Patterson's waffle subsequently, to conclude who precisely should be spending the rest of their life in prison for perverting the course of justice in British Occupied Ireland. The cause of peace in Ireland is not served by the denial of justice. The only cause served by keeping Marian Price and other political prisoners of conscience interned without a proper trial Maghaberry, is the cause and coffers of the bloated secret service British taxpayers budgets. There is a call for those who genuinely want peace in Ireland, to work for justice and protest in Dublin on Sept 15th at 2pm, from the Garden of Remembrance.